Shaikh Abdul A’laa (may Allaah preserve him) discusses this affair that Ahlul Bidah of the earlier times used to utilise the Arabic language as a weapon to find fault with Ahlul Hadeeth; so let this be reminder for the misguided Hizbiyyoon and their blind followers! 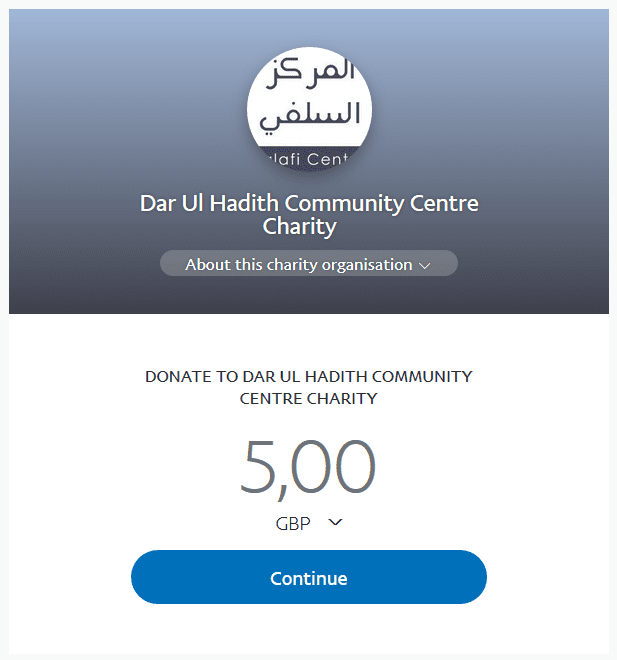 The Shaikh stated that the people of desires, such as the Mutazilah, the Mutakallimeen and their ilk used to praise themselves that they are people of Lugha (i.e. people who are well versed in the Arabic language) and they used to belittle the people of hadeeth because they were not like them in field of language. They used to utilise their vast knowledge in the language and philosophy as a weapon to displace statements from their rightful places- whether that was in the Qur’aan, the narrations of the Salaf or the statements of the people of Hadeeth. Therefore, the sciences of the Arabic language are used as a means of serving the sciences of the sharee’ah- they are a means of fulfilling a goal and not a goal itself, just as Imaam Dhahabi stated that there is no problem with grammarians and that their knowledge is something needed; but if a grammarian goes into excess in the Arabic language and is deprived of knowledge of the Book and Sunnah, he remains idle, inactive and very playful. Therefore, the one who speaks ill of a person from Ahlul Hadeeth Wal Athar, that his knowledge of the Arabic language is weak, has indeed followed the way of Ahlul Ahwaa in this affair. 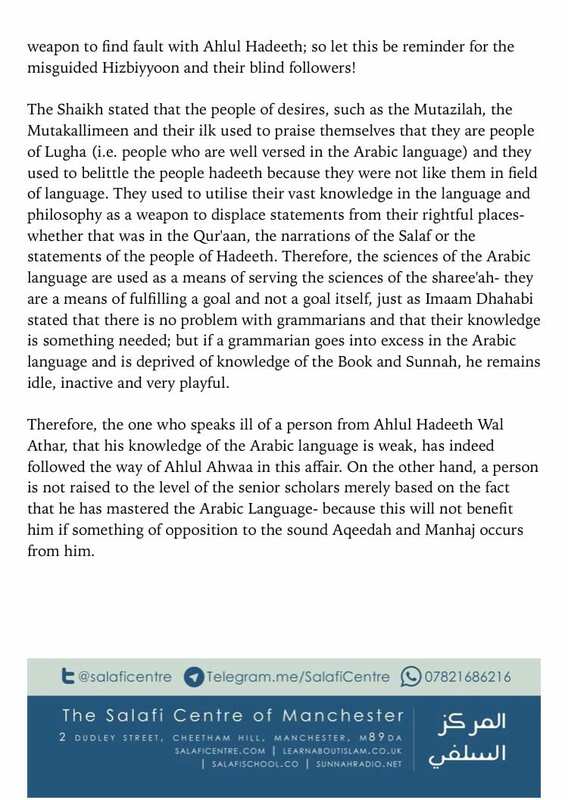 On the other hand, a person is not raised to the level of the senior scholars merely based on the fact that he has mastered the Arabic Language- because this will not benefit him if something of opposition to the sound Aqeedah and Manhaj occurs from him. Then the Shaikh said that he is amazed by the one who desired to praise one of the students of knowledge, saying that indeed he (i.e. that student) rarely commits a grammatical error in his speech; but this on its own is not enough a reason to praise a student of knowledge; rather a student is praised because he adheres to the Aqeedah and Manhaj of the Salaf. Then after this, there is no harm in praising him for the fact that he rarely makes grammatical errors. Similar to this is also praising someone because he has Memorized a lot- there are those who praise such and such person because he has memorized the kutub as-sitta (i.e. Saheeh Al-Bukhaari, Saheeh Muslim, Sunan Abu Dawud, Sunan Tirmidhee, Sunan Nasaa’ee and Sunan Ibn Maajah) or such and such from the books of the Sunnah; but when one becomes closely acquainted with the affair of this person, he finds that this person has mistakes in his Aqeedah and Manhaj. Likewise, there is that one who boasts that he has memorized the entire Qur’aan together with the ten Qiraa’aat and he considers this to be the highest level of knowledge; rather Shaikhul Islaam Ibn Taymiyyah spoke the truth when he stated that the Qur’aan praises the one who is upon proof from his Lord- the one upon guidance, light and clear-sightedness-whether he has memorized the Qur’aan or not.